Indian Agent Thomas had spent numerous stressful years lobbying Washington to secure the right for a number of Cherokees to remain in North Carolina. Senator Thomas experienced years of constant political infighting with rivals. Colonel Thomas, advanced in years, had endured four exhaustive years of combat, witnessed death and dismemberment of several comrades, handled dead bodies, absorbed the traumatic loss of comrades, evaded assassination attempts, faced imminent death, killed during the Civil War, was helpless to prevent others' deaths, endured several court-martials, and witnessed his beloved Cherokees starvation in 1864. Furthermore, by 1865, he was a defeated Rebel of the "Lost Cause," and how would the Victor, the United States, respond to Thomas and his rebellious Indians? Would his many exhaustive but fruitful years as mediator and voice of the Cherokees be crushed as the Rebellion was crushed? What will become of his rebellious Indians? Thomas and his Cherokees faced a very uncertain and questionable future. He also witnessed mumps, measles, and smallpox kill more than one hundred Cherokees (letter written by Thomas concerning smallpox). His selflessness and profound generosity kept him in debt and on the constant brink of bankruptcy, and he also endured several lawsuits. His father had died months before his birth and while Thomas was in Washington conducting business, his adopted father, Chief Yonaguska died. 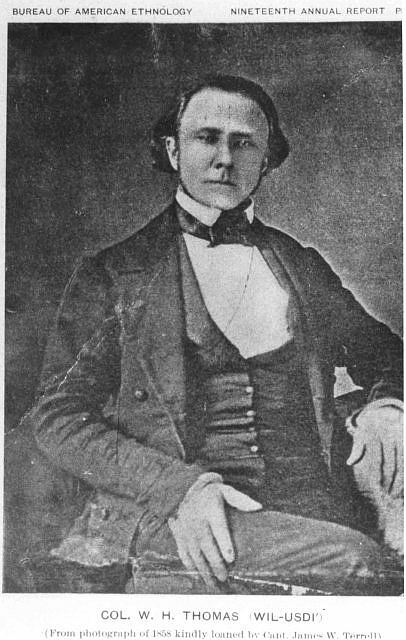 Will's mother passed away on October 1, 1874, while his wife died on May 15, 1877. Furthermore, mental illnesses, including Post Traumatic Stress Disorder (PTSD) and Major Depressive Disorder (MDD), pervaded many Civil War veterans during the Reconstruction Era. During the Civil War there was no shell shock, battle fatigue, or Post Traumatic Stress Disorder (PTSD) to help explain and legitimize a mysterious condition.